In this article you getting Free Css Editors that available online. Css Editors tools is mainly used for not only edit your css also use for HTML editor. I'm choosing Best Free Css Editors online so you can save time from them. Hi friends, I am the author of the blog designprefix - blog with lessons for beginners and beyond, everyone will find something useful for themselves. On my blog will be able to find their inspiration , join the update, and run in for a visit, always happy. Below there are a text editor that is used by programmers and web designers. The main difference between this editor - it's a good functionality and user-friendly interface. Notepad + + is able to open multiple documents simultaneously, highlight the huge number of programming languages ​​to write macros that automatically complete the text you type, and more. This text editor supports such features as lighting wizard, print mode WYSIWYG, create your own API-file and a huge number of possible functions for working with the dough. Also, the program allows you to connect a variety of plugins that can provide additional functions. Editor PSPad is a free text editor designed to simplify the work of programmers. This editor can work with several programming languages. Also, it does not highlight is the problem code. Editor PSPad editor is successfully used with the text of plain text. Distinguishing features: a small tool availability, simple management and an incredibly powerful code editing. Skybound Stylizer is a WYSIWYG-editor CSS styles, one of the best of its kind, working on operating systems Windows. This utility is able to significantly simplify the work of the webmaster, or rather writing and editing CSS. This editor is designed for those webmasters who are able to go beyond that of a conventional word processors for handling CSS. TopStyle 4 - is the final version of the famous Windows-editor, like CSS, and HTML-code, which was created by one of the developers of HomeSite. What can an editor? TopStyle 4 is able to support Unicode and edit documents via FTP. Also, the editor includes special modifiable toolbar, and various code hints, intended for ASP, PHP, and ColdFusion. More TopStyle 4 supports bookmarks, edit CSS-code in the HTML-attributes, and much more. This program has a unique analysis tool designed for all interested web standards. Through this program, you can deepen their knowledge in CSS and HTML , as well as get detailed information about this or that element with a competitor's site. Also, with the help of Xyle scope you can see their own work, so to speak, with fresh eyes. 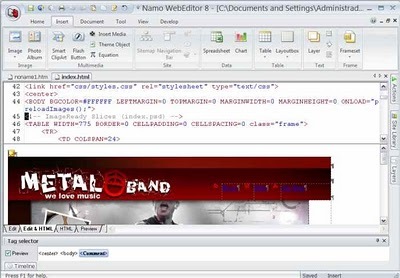 This program allows to easily create and edit cascading pages are located regardless of their size. You can write code tables manually, and can be trusted with a Rapid CSS Editor. The program has a huge amount of support functions, for example, CSS validator. The program includes built-in preview, so the results of this work can be viewed in real time. In addition, Rapid CSS Editor is also a HTML-editor, which can easily work with CSS HTML editing. This program is designed to handle the styles of CSS. It contains multiple options to view and edit styles, and test them for compatibility with W3 standards. In addition, EngInSite CSS Editor is involved in mapping the entire work in different browsers. This tool is able to check the syntax, contains an internal help system and several other very useful for webmasters lotions. Arduo Css Editor - CSS Editor is a free. It is simple to use and has a pleasant interface, which contributes to the creation of style sheets without manually writing code. This program allows you to view HTML on the dynamics of the impact of a particular style of change. That is, the main feature of this editor is intuitively simple and very user-friendly interface that allows you to save significant amount of time spent at work. Simple CSS-editor of styles, the main feature is its price - it's free. This program allows the webmaster to work with multiple projects. Just like other similar tools, Simple CSS has a preview function, which can show how it will look the final result. The program is easy to use and has enough features. PS Thanks for the guest post, you can see that free software lacks full, and many editors are quite functional - meaning no software to buy. I personally use Notepad + + because it also allows you to conveniently enough CSS to edit HTML and PHP files.